What Did Historic Cider Taste Like? I gave a bottle of cyder to a casual acquaintance. I expected he and his wife would try it and say something similar to the above. Instead they held an informal tasting with friends. 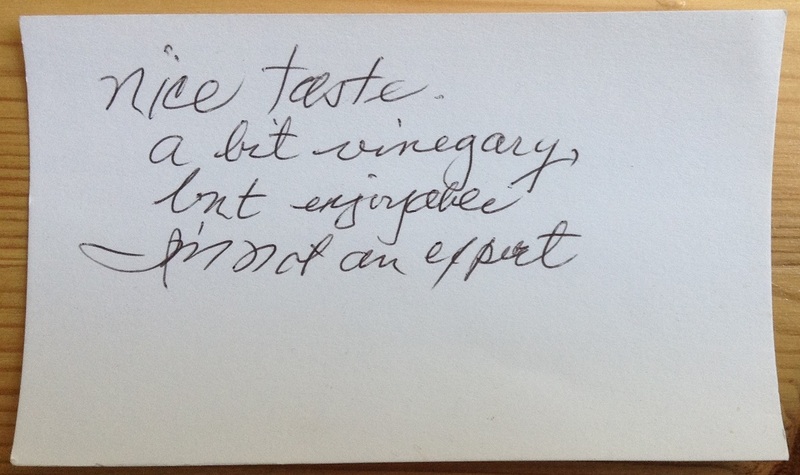 They even made comment cards, which they shared with me when they returned the bottle. 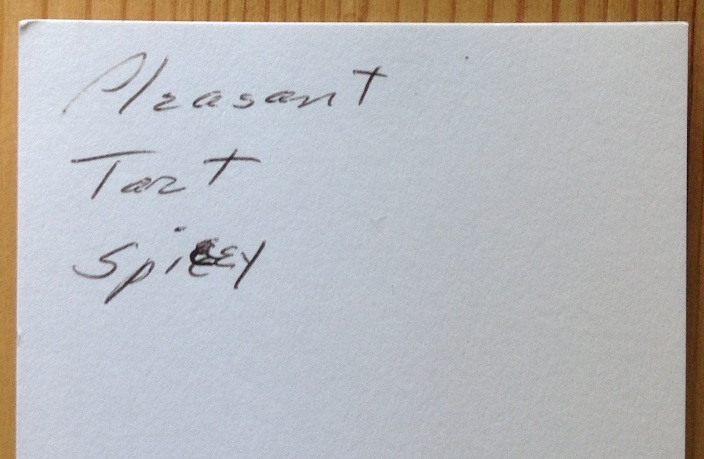 As you can see the general consensus from their tasting is the cyder was somewhere from spicy to sour. This is not an uncommon reaction to my cyders. Especially since I don’t arrest the fermentation to leave a residual sweetness or back sweeten. Most modern commercially-produced ciders are heavily back sweetened, which is what most people are used to. But the charm of historical cider is that it’s generally what nature gives us and nature can be on the tart/sour side. At least that’s what my cidermaking experiments suggest. But what do historic sources say cider tasted like in the past? …a brisk, tart, cool Liquor prepar’d from Apples. It seems our pre-Prohibition ancestors enjoyed ciders which were significantly sharper, tarter, or sourer than most modern ciders. For our purposes today “then” is anytime before Prohibition (1920). Some general flavor preferences are known but they’re usually extreme examples.For instance, one cider history stated that, “…Herefordshire labourers preferred cider so sour that it tasted like vinegar to strangers.” R.K. French, The History and Virtues of Cyder (New York: St.Martin’s Press, 1982), 17. There are many seventeenth-, eighteenth-, and nineteenth-century sources which compare cider to other alcoholic drinks, most commonly to Rhenish wine (think dry Riesling). Oh,to make cider like this! AUTHOR’S NOTE: This post was updated on 25 February 2017. Interesting post! However I don’t think this is a very strong case for pre-prohibition ciders being considerably more acidic than ciders today. There is historical data from the Virginia Agricultural Experiment Station from 1903-1904 that shows acid levels of an assortment of ciders commercial and otherwise that are right in line with what you might expect from ciders today. On pg. 29, the chemical analysis is given with total acids as sulfuric, which can be converted to malic (typical for modern cider acid measurements) by multiplying by 1.367. The majority of values range from 5-8 g/L of malic, which is right in line with what Claude Jolicoeur recommends in the New Cidermaker’s Handbook. I would also say that the excerpts from historical texts seem to highlight the fact that cider SHOULDN’T be too tart – “pleasant acid,” “by no means sharp.” The part about a “Rhine wine” indicates a comparison to a high acid white wine, like Riesling, which isn’t necessarily perceived as “sour” as the acidity is usually balanced by sweetness. This instead tends to taste “refreshing” more than anything. While it is true that North American dessert/culinary apples tend towards sharp, this isn’t necessarily “what nature gives us.” Humans still select which apples get propagated and which apples go into a cider. These days, the only apples that are left in the ground are apples that are good for eating, which tend to have medium to high acid. Historically, seedling/wild apples, which is what most people used to make cider from, would have acid levels all over the chart. So your experience today does not parallel that of pre-prohibition farmsteads or cidermakers unless you are only gathering apples from wild apple trees. It is likely, however, that farm ciders were more likely to be vinegary. Even in pre-prohibition days this was considered a fault, or at least inferior to ciders that did not contain vinegar from acetobactor infection. The Virginia Agricultural Experiment Station data does indicate some volatile acidity in some of the ciders, and these are right around or below the aroma threshold of .6-.9 g/L. 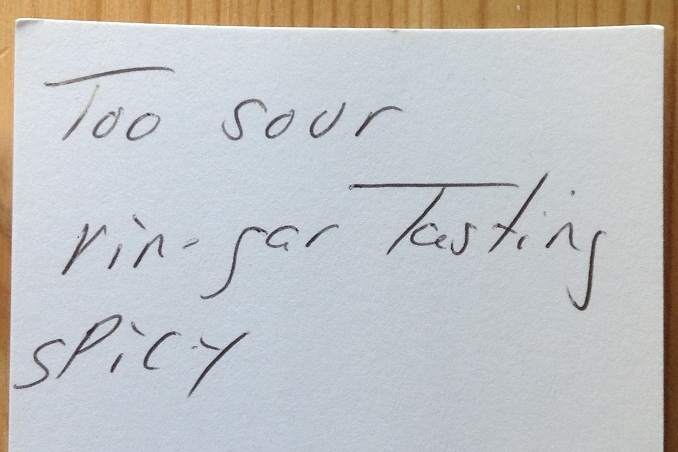 In the notes, the author makes no mention of vinegar aroma or flavor. Thanks for taking the time to read the post and for sharing your thoughts and sources. I hadn’t seen the VA Ag study before. Even with sources, it’s difficult to compare tastes over time, but from your comment I see that perhaps I was perhaps too imprecise. I’ll be more careful in the future. Especially as my understanding of these things, which is a work in progress, grows.